Bridge the innovation-market gap by accessing clients based ecosystems and networks. Our aim is to leverage our expertise and industry network to help early and expansion stage companies realize their full potential through market driven partnerships based on process and collaboration. 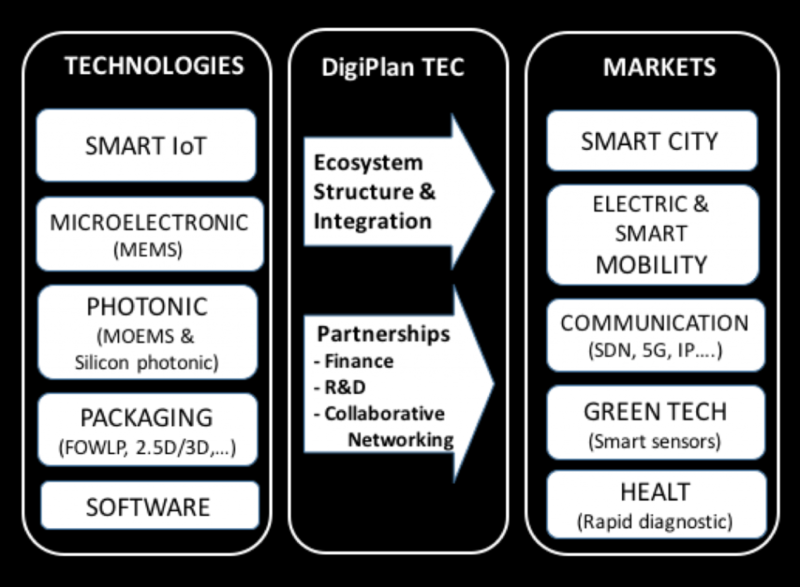 DigiPlan TEC is a private consulting firm. The main activity of the firm is to bridge the financial link between technology and market driven opportunities. On the market side, we address the Smart City, Electric and Smart Mobility, Communication, Green energy and Health ecosystems. On the technology side, the focus is on Smart IoT, Microelectronic, Photonic, Packaging and Software. The global economy is making things more challenging for electronic and high tech firms. The dematerialisation trends and commoditisation of hardware is behind the race to deliver higher value high performance products and services on a real time basis. In that context, we are involved in opportunity identification, execution of the deal and alliance identification and management. Our key partners are active in finance, technologies, manufacturing and marketing. We provide market research, positioning analysis and communication strategy to emerging firms, start-up, established companies, major specialist groups and associations, VCs and investors, public organisations and governments, as well as research centres. We also structure collaborative projects in R&D and marketing. 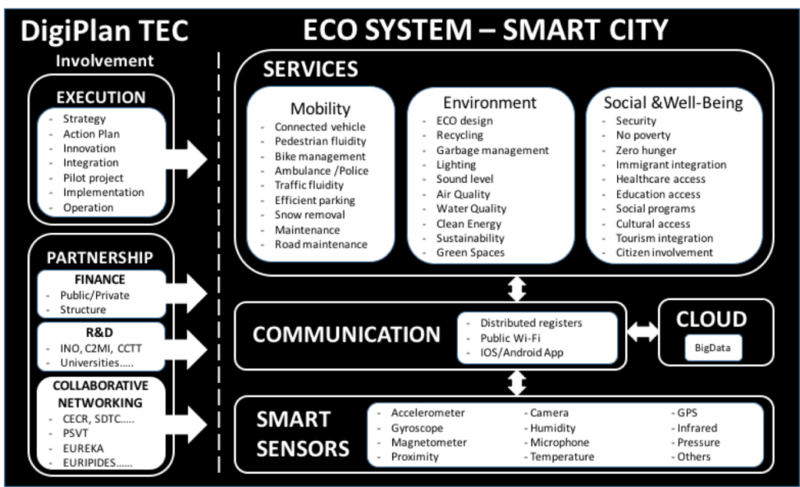 The following picture is the eco-system for SMART CITY that are available for many other end market. 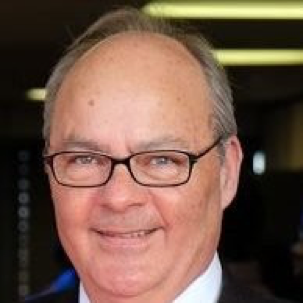 Jacques is specialised in project management, business development, finance and marketing. He has experienced in the development of early stage enterprises and management in information technologies, communication and green tech sectors. 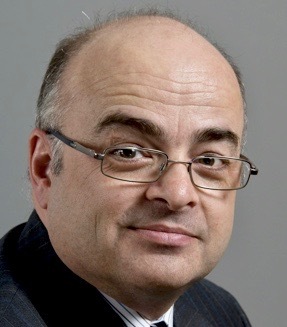 Gilles is specialised in linking technologies to market opportunities interacting at all levels of industry, governments and financial institutions. 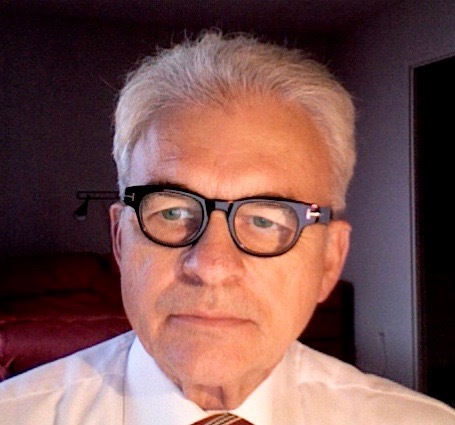 His work includes the development of several market driven partnership for small and large companies in communication, ITS, software, microelectronic and photonics. Pierre is specialised in business development and industry-government relations for small and large organisations in transport and health. He plays leadership roles in national and provincial advocacy industrial associations.